Johns Pass is located on the southern end of Madeira Beach at 12901 Gulf Blvd Madeira Beach, FL 33708. Its a fun place to hang out or have dinner or drinks. 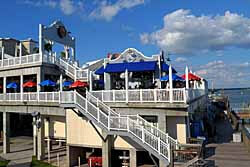 There are a number of waterside restaurants and bars, and a wide variety of shops. There is also a man-made beach for relaxing and there is some great fishing right off the shores. Its been said that Johns Pass is the #1 tourist attraction in Pinellas County. We like to have a casual dinner at one of the waterside restaurants, and then take a stroll on the boardwalk, and check out what's new in some of our favorite shops. There are several restaurants with water views. One of our favorites is The Hut Bar and Grill. They mostly serve "bar food" but what we like about it is that you can sit outside on the dock and have great views of the harbor. You almost always see pelicans and most of the time we've seen a dolphin or two surfacing as they go through the channel. The Hut also has 30 different beers on tap and a wide selection of cocktails and frozen drinks. Bubba Gumps is upstairs with lots of seafood selections, Hooters is also upstairs with their versions of bar food. The Hungry Fisherman has waterside dining with lots of fried and broiled fish/seafood selections. There are over 100 merchants in the village. There are lots of gift shops like you might expect. If you are looking for nautical or beach theme furnishing or decorations for your condo or home, there are a number of choices where you can get some cute and unique items. The Bronze Lady is one of our favorites for unique decor items. There are also quite a number of jewelry shops. Most of these offer unique artisan items that often have a beach or nautical vibe. You can book a dolphin watch tour, rent jet skies, or book a sailing cruise. If you like to fish, there are several charter boat and party boat options. condos on Madeira Beach or the nearby single family homes for sale. Please give us a call at 727-619-2799 if we can help you with your real estate needs or if you just have a question about the area.